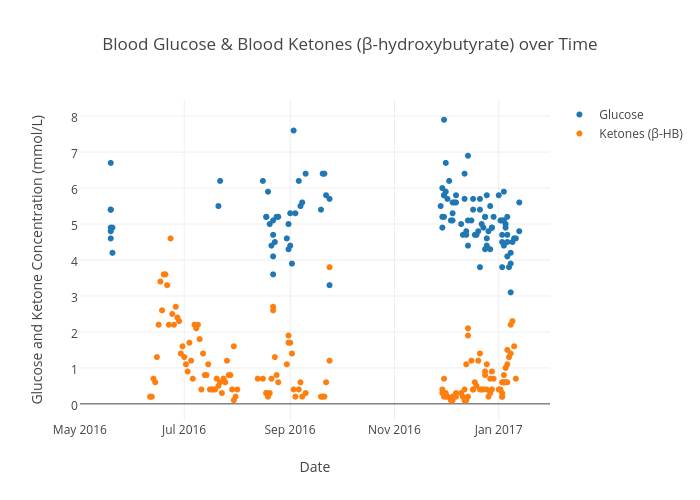 Danidewitt's interactive graph and data of "Blood Glucose & Blood Ketones (β-hydroxybutyrate) over Time" is a scatter chart, showing Glucose vs Ketones (β-HB); with Date in the x-axis and Glucose and Ketone Concentration (mmol/L) in the y-axis.. The x-axis shows values from 2016-05-03 11:18:24.9837 to 2017-01-28 12:41:35.0163. The y-axis shows values from -0.38943552563438644 to 8.389435525634386.